Greetings from the Australian National University in Canberra, where a forum is being held to redevelop "Union Court", the central space of the campus. Professor Marnie Hughes-Warrington reminded us that the ANU was founded 70 years ago by people with a vision and while on-line virtual infrastructure is important for a university, it also needs physical infrastructure (buildings). The aim is to redevelop the central courtyard and the adjacent library to showcase 21st century education. Some possible facilities are a maker space, co-working space and possibly a swimming pool. There is also scope for sculpture (I suggest something by Merick Fry). A few years ago I looked at classroom design and learning commons across Australia and some other countries. I found that simple designs with rectangular walls, flat floors, movable furniture and white-board walls, were preferable. Gimmick technology, such as immersible displays, tended not to be used (whereas WiFi was). The best examples of this I have seen around the world are at University of Canberra, with their Inspire Centre and the Teaching and Learning Commons. The new ANU buildings will likely include accommodation, as ANU guarantees all students somewhere to stay. One aspect I would like to see is considering the future nature of a university education, especially for promoting innovation. While designing a course on innovation I noticed the similarities between the Cambridge (UK) which hosted thousands of new hi-tech businesses and the area between ANU an Canberra's CBD, which I have christened the "Canberra Business Boomerang". ANU Union Court is on University Avenue, an important land axis of the 1912 plan for Canberra by Walter Burley Griffin and Marion Mahony Griffin. The ANU is on the site originally set aside by the Griffins for a university. This will therefore require consideration of the effect on the city of Canberra and the nation of any ANU plan. This is not just a matter for the university. Some framework plans were show at the forum. These reminded me of the avenues at University of British Columbia, Vancouver Campus, which I spent a week at last year. 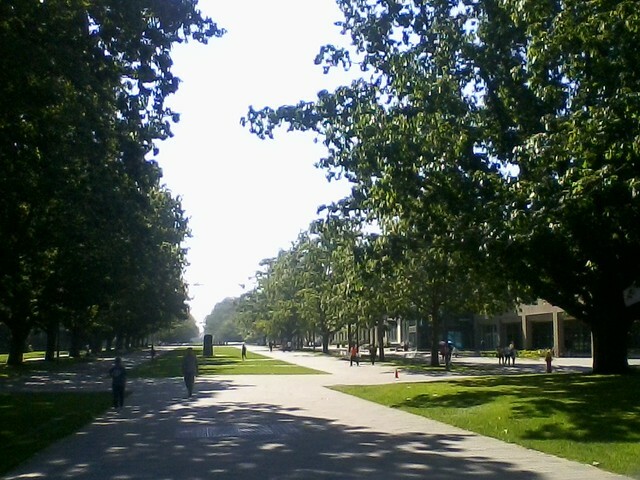 But UBC's avenues are a little sterile, lined mostly with academic buildings and offices. The proposals for ANU include not only cafes, but also student accommodation. This would make the area more lively day and night. One aspect of the ANU Urban Design Framework Plan which worried me is a proposal for a tower which appears to be about 13 stories high. This does not appear to be a building, but a non-functional sculpture (it looks like a miniature of the Shanghai World Financial Center, crossed with the Freedom Towers NY). But perhaps it is intended to bookend the American War Memorial at Russel Offices. Having a very tall and useless architect's folly is not in keeping with the rest of the plan. The ANU already has one more practical tower, the Physics Accelerator Tower. Also an amphitheater is proposed on the banks of Sullivan's Creek. The artist's impression reminded me of the beach at the German Chancellery Building next to the Spree River in Berlin. In summer, the chancellor's staff sun themselves by the river. As well as educational activities, such an amphitheater would be an excellent location for plays, similar to the Cambridge Shakespeare Festival. In environmental terms, it was claimed at the forum the new development will use only "half a planet" (a much smaller footprint than comparable developments). The development will also be designed to reduce the social isolation of the students. There are precedents at ANU for such plans, as described in Milton Cameron's 2012 book "Experiments in Modern Living" about the design of ANU's original buildings. However, while union court will be symbolically important as the center of the university, it will rarely be seen by future students of the university. Within ten years, well within the design life of the new buildings, students will be studying mostly on-line. Typical studies will be about 20% on-campus. The campus will still be important for students, in some ways more important, but will be somewhere they do not spend much time at. While the forum on ANU University Court was useful, it missed the important point that the on-line virtual infrastructure is now more important than the physical infrastructure.It is now routine to provide educational materials on-line before face-to-face events. This "flipped classroom" approach should also be applied to consultations on ANU Union Court. The plans should be provided on-line before, or at the latest at the same time, as they are shown at face-to-face event. This will help the small number of people who can attend as they can then provide more informed comment. More importantly, this will allow the majority who cannot attend to be informed and have the opportunity to provide input.